Parshuram Puja Vidhi – Procedure – With Mantra – How To Perform Parashuram Puja? Parshuram Avatar of Vishnu is the sixth avatar among the 10 prominent incarnations of Vishnu. Puja and prayer of Parashuram form of Vishnu is performed to be blessed with wealth and property. Parshuram Puja Vidhi along with mantra is given below. Please note that this how to perform guide is ideal for performing puja at home. When to Perform Parshuram Puja? On Krishna Paksha Sashti tithi – sixth day during the waning or dark phase of moon. On Shukla Paksha Tritiya tithi – third day during the waxing phase or light phase of moon. Akshaya Tritiya – which is also observed as Parshuram Jayanti. When there is Uttara Phalguni Nakshatra in a Hindu month. Highly meritorious to perform the puja when there is a rare combination of Krishna Paksha Sashti or Shukla Paksha Tritiya and Uttara Phalguni or Uthiram Nakshatra. Will be blessed with wealth and property. To get out of poverty and to achieve prosperity. 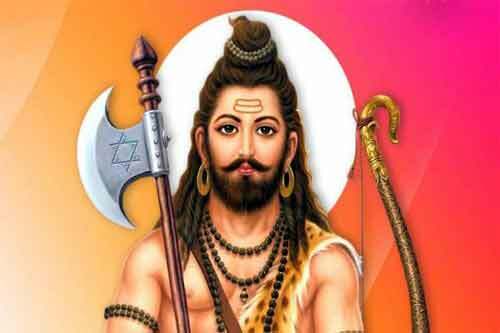 How to Perform Parshuram Puja? The puja is to be performed in the morning after sunrise or during pradosh period 1.5 hours before sunset. The puja is to be performed in the north side of the house. The murti of Vishnu (painting or sculpture) in Parasuram form should be kept on a red color color cloth. Take a kalash fill it with water and put eight green gram (moong) in it. Close the kalash with a coconut and green leaves. Keep this near the picture of sculpture of Parashuram on a red color cloth. Light lamp using red color oil in a bronze lamp. Dhoop should be of Tagar flower. The bhog or Prasad for the day should be prepared using Jaggery. Usually, roti of jaggery is offered. Chant the mantra ॐ ब्रह्मक्षत्राय विद्महे क्षत्रियान्ताय धीमहि तन्नो परशुराम: प्रचोदयात्॥ 108 times on a tulsi or chandan mala. Offer anjeer (dried figs) to Parashuram for achieving wealth and property. Offer red coral beads to Parashurama and then keep it in locker or where you keep money, this will make sure that there will be no poverty in the house. Write name of your enemy on bhoj patra using roli. Offer it to Parshuram and later burn it off. This will help you to achieve victory over your enemy.